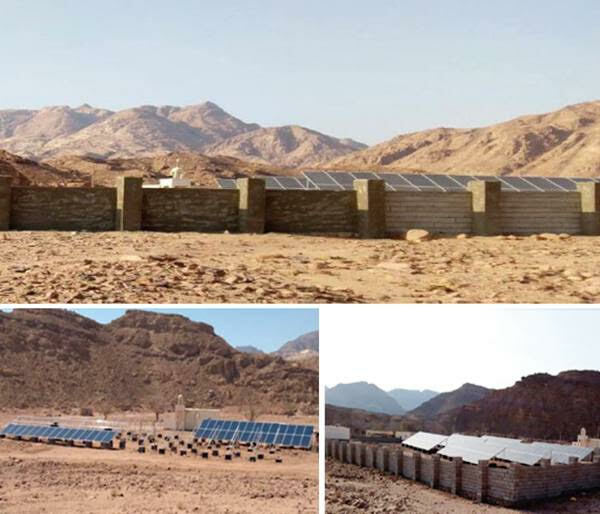 JinkoSolar Holding Co., Ltd., one of the world’s largest solar module manufacturers, today announced a partnership with Schneider Electric., to donate a 55kW off-grid solar project in Abu Redis, South Sinai, Egypt. The remote village called ABU GHURAQD is located about 30 km away from Abu Redis, which comprises of 35 families, Mosque, a school, a small medical center and three farms. The total connected power load includes 15kW residential load and two 25kW irrigation pumps. Prior to completion of the project, the only electricity source of the village has been three 30 kW diesel generators supplying the village with electricity for merely 8 hours per day, which could have not sufficiently met the power load demand. Besides, the noise and air pollution caused by diesel generators were another issue for local residents. The project has been successfully completed and solved several challenges including governmental approvals and permissions, material security and transportation, as well as operation and maintenance responsibility. The completed off-grid solar power system covers power load for the village for 20 hours per day, significantly improving the life quality of the local residents. Reduced operation time of diesel generators is also helpful for environment protection.